"One of my favorite people. She ran the "Hotel Parker" in..."
EXETER, N.H. - Marjorie W. (Trask) Parker, 87, of Exeter, N.H., former longtime resident of West Newbury, Mass., passed peacefully, in the tranquil surroundings of the High Pointe House in Haverhill, Saturday afternoon, Jan. 19, 2019.Born in Belgrade, Maine, Sept. 18, 1931, she was the daughter of the late Sumner and Mildred (Stevens) Trask. After graduating from the University of Maine in Orono with a degree in French, she taught high school in Dixfield, Maine, where she met her husband, Bob. The family moved to Massachusetts in 1959, first to Georgetown, and later to their home in West Newbury in 1961. Marjorie began her career as an elementary school teacher in 1967, working at Central School and the Page School in West Newbury, teaching third grade and computer science. She later earned her master's degree in education from Salem State University in 1987. In her later years she moved back to Belgrade, Maine, for a number of years, before relocating to Exeter to be nearer her children and grandchildren.Marge, as she was known to her friends, enjoyed gardening, and was a member of the West Newbury Garden Club for many years. She was also active in the teacher's union and was a lifelong proponent of minority and women's rights. She was one of the first teachers in the area to introduce computers in the classroom at the elementary school level, and managed to overcome her initial apprehension to become quite accomplished in the field.Marge was well known for her baking. Many a weekend morning would find her baking since 5 a.m. Quite often there were fresh muffins when Bob and the kids got up. Her "black moons" (aka whoopie pies) and O Henry bars were famous among the neighborhood children, and her baked goods were known to mysteriously disappear from the freezer. 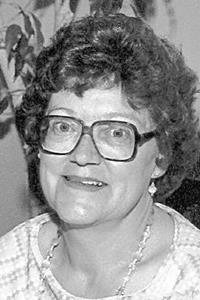 She enjoyed music of all genres, was an avid reader, and an enthusiastic fan of PBS, especially history programs. She was able to spend a good deal of time with her oldest grandchildren when they were young, taking them to various lessons and watching them after school, and she hosted an exchange student from Brazil. She kept a journal for decades, noting the weather each day and special events. Whenever there was a question about when something happened, Marge's journals often had the answers.In addition to her parents, Marge was predeceased by her beloved husband, Robert W. Parker who died March 5, 1987; her brother, S. Everett Trask; sister-in-law, Dolores (Cabana) Trask and niece Gail (Trask) Hudson.Those left behind to cherish all the wonderful memories of her life include her sons, David E. Parker, partner Dr. Lavina Dhingra of Naples, Fla., Steven W. Parker, wife Kathleen E. (Otis), of West Newbury, Mass., and Christopher E. Parker of York, Maine; her daughters, Bethany P. Dominick, husband, Jeffrey of Townsend, Mass., and Debra J. Cook, husband, Bruce of Ashburnham, Mass. ; grandchildren, Andrew W. Cook, fiancee, Emily Weiss of New York, N.Y., R. Sean Parker, wife, Stephanie (Tanner) of Groveland, Mass., and Kathleen E. (Parker) Hollander, husband, Cristopher of Newton, Mass. ; great-grandchildren, Ryan, Charlotte, Kaiden and Jaxon; sister-in-law, Rita (Courbron Seeley) Trask, of Gray, Maine; nephew, David Trask, wife, DeAnna (Cochran) of Skowhegan, Maine; nieces, Sharon (Trask) Young, husband, David, of Gray, Maine, Cynthia (Trask) Davidson, husband, Andrew, of Belgrade, Maine, along with stepgrandchildren, great-grandchildren and great-great-grandchildren, extended family and many dear friends and neighbors. She was an inspiration to each and everyone in her life, and she will never be forgotten.A memorial service is planned for the spring and an announcement will be made at a later date.Those wishing to honor Marjorie's memory may make a donation to: The Kitty Angels(kittyangels.org)or a feline rescue organization of your choice.